In other words, the chiles we know as poblano peppers are fresh chiles that are harvested before ripening, which is why they're green. It's what your basic chile relleno is made with. But when allowed to ripen, poblanos turn red and develop additional sweetness, which in turn balances out their already mild heat. Thus anchos are red while poblanos are green. Incidentally, the word ancho translates to "wide" in English, while poblano refers to the state of Puebla in central Mexico where the peppers are supposed to originate. Ancho chiles can be reconstituted by soaking them in warm water, or they can be ground up or crushed and added to a recipe in that fashion. Drying the chiles don't affect their heat, although the way the heat is transmitted will depend on how finely crumbled/ground they are, and whether they're reconstituted first or not. In other words, crumbled up chiles will give you a more localized spiciness whenever you happen to get a piece (or several) in a particular bite. On the other hand, ones that are reconstituted first and then puréed will disperse their heat more evenly throughout. 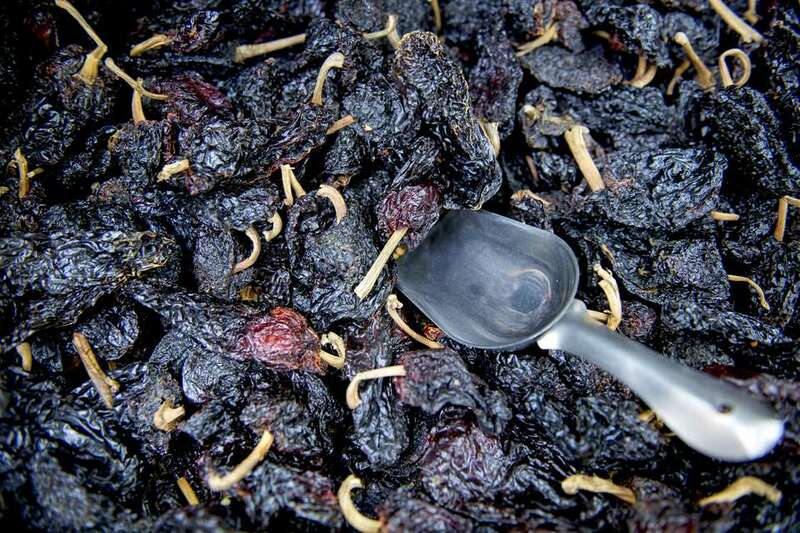 Ancho chiles have a deep red color and a wrinkled skin. Sweet and smoky with a flavor slightly reminiscent of raisins, their heat is mild to medium-hot. You could also use a spice grinder to grind dried ancho chiles into a powder to use in spice rubs or for making mole, enchilada sauce, and chili. Ancho sour cream will change your life, but only if you use full-fat sour cream. (If you use reduced-fat sour cream, it will still taste great, but won't rock your taste buds the same way!) Soak the dried pods in hot water for 30 minutes, then remove the seeds and stems. Combine the reconstituted peppers with some sour cream and purée until smooth. Serve with baked potatoes, stir into mashed potatoes or simply enjoy with any food you already eat with sour cream. You could also use a similar approach to make a spicy ancho cream sauce to serve with enchiladas—but instead of sour cream, use Mexican crema. Ancho chiles register between 1,000 and 2,000 Scoville heat units, which means they're quite mild. They're sometimes incorrectly referred to as pasilla pepper (as are poblanos, for that matter) but they're not the same thing.